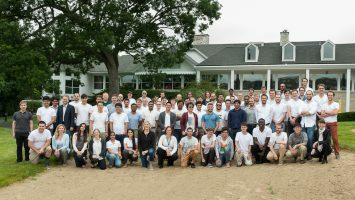 The Argonne Training Program on Extreme-Scale Computing (ATPESC) provides intensive, two-week training on the key skills, approaches, and tools to design, implement, and execute computational science and engineering applications on current high-end computing systems and the leadership-class computing systems of the future. 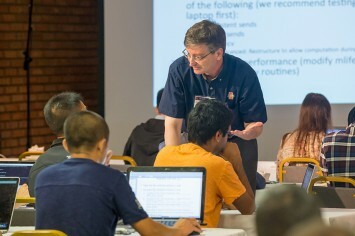 The core of the program will focus on programming methodologies that are effective across a variety of supercomputers and that are expected to be applicable to exascale systems. 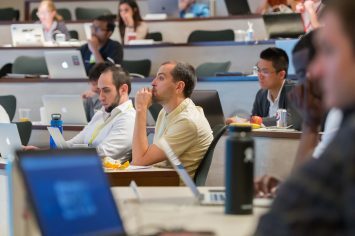 Additional topics to be covered include computer architectures, mathematical models and numerical algorithms, approaches to building community codes for HPC systems, and methodologies and tools relevant for Big Data applications. 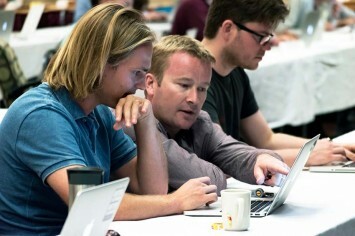 Doctoral students, postdocs, and computational scientists interested in attending ATPESC can review eligibility and application details on the application instructions web page. Note: There are no fees to participate. Domestic airfare, meals, and lodging are provided. 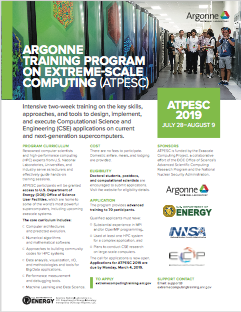 The U.S. Exascale Computing Project has announced its 2017 Argonne Training Program on Extreme-Scale Computing (ATPESC) Scheduled for July 30-August 11, 2017 Computational scientists now have the opportunity to apply for the upcoming Argonne Training Program on Extreme-Scale Computing (ATPESC), scheduled for July 30 to August 11, 2017 near Chicago, IL. The deadline for applicant submissions is Friday, March 10, 2017.